A fixture on Wyandotte Street East for over three-quarters of a century, The Tivoli Theatre has undergone many transformations since its debut as The Walkerville Theatre in 1918. Designed by renowned architect Howard Crane, the creator of Detroit's Fox Theatre and Music Hall, the theatre lost most of its former charm and beauty during the last thirty years. When the theatre first opened, it was illegal to show movies on Sunday. The Tivoli, as it became known in 1930, enjoyed great success by offering both silent movies and vaudeville acts, guaranteeing it an audience every day of the week. Early theatre goers could choose to watch the shows from either Windsor or Walkerville as the town border ran right down the middle of the theatre! 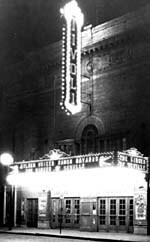 Vaudeville gradually faded away after the introduction of sound motion pictures in the late 1920's but live theatre made a short-lived comeback in 1959 when the Windsor Light Opera Association staged a musical and briefly considered buying the acoustically exquisite building for its permanent home. The Tivoli was instead converted back into a movie house and was known as "The Tiv" until closing in 1965. In later years it was briefly resuscitated as a bingo hall and then as a community music/ dance studio but its doors have remained closed for the last few years. Today, many area residents barely give the derelict building a second glance. For those alert individuals who have noticed some activity in the building lately, you haven't been seeing things. David Booth and Jim Shaban of Magic Theatres purchased the theatre in July of 1998 and are in the process of giving it a much needed facelift, both inside and out. Not only are they restoring the building to its former grandeur, they are renaming it The Walkerville Theatre and are reviving its original function as a performing arts venue. To ensure the viability of their venture, they are installing a nursery school on the main level of the theatre.